Chim (pronounced shim) was the pseudonym of David Seymour (November 20, 1911 – November 10, 1956), a Polish born American photographer and photojournalist. He is especially well known for his empathetic photos of people, especially children. A notable collection was the result of a commission by the United Nations Educational and Scientific Organization (UNESCO) to photograph the Children of Europe after World War II. His pictures showed both the physical and spiritual damage the war had done to this generation of young people. A founding member of Magnum Photos, together with Robert Capa and Henri Cartier-Bresson, Chim traveled extensively in Europe and the Middle East, recording images of social change. Chim was fluent in several languages and developed deep connections with many cultures. He did not focus on war and action, but rather on the impact war, or other social events, had on the people. His unforgettable photos of those who suffered, such as war orphans, were complemented by his work with celebrities. In every case he captured the emotions of his subjects, whatever emotion that was. His work served to inform the world, moving people's hearts with empathy and compassion for those who might otherwise have remained distant. David Seymour was born David Szymin in Warsaw, Poland, to Jewish parents, on November 20, 1911. David had an excellent education, attending the Jewish Gymnasium Ascolah and the Adademie der Graphischen und Buch Küenste (Academy of Graphic and Book Arts) in Leipzig, Germany, where he studied color printing techniques. Graduating in 1932, he left Germany, where the Nazis were gaining power, returning to Poland where he found economic problems and fascism on the rise. He decided to move to Paris, France, planning to study science at the Sorbonne. To support himself, he borrowed a camera from a friend and began his career in photography. This friend was David Rappaport, owner of the pioneer picture agency Rap, which provided photographs to publishers of books and magazines. Today it is one year since I came to Paris—an important anniversary that puts me in a mood for reflection and memories. As you know, I am not any more working at reproduction (lithography). I am a reporter, or more exactly, a photo-reporter… My stories appeared lately in Paris-Soir (about the Metro.) Regards will publish my two big stories. Basically I am satisfied with myself, because I am working well. I know what I want at this moment and I am making progress in that direction. But I want to do something bigger. Then, socially, I am moving in new circles, away from the Polish gang. I am more among photographers, thinking people, interested in the same problems as myself. We are trying to organize some kind of association of revolutionary-minded people. These photographer friends he wrote about were André Friedman, later to be known as Robert Capa, and Henri Cartier-Bresson. They formed the core of the group that would found Magnum Photos more than a decade later in the United States. Chim's coverage of the Spanish Civil War, Czechoslovakia, and other European events established his reputation as a photojournalist. In 1939, he documented the journey of Loyalist Spanish refugees to Mexico and was in New York when World War II broke out. There, he changed his name to David Seymour, although he kept the pseudonym Chim for his work. In 1940, he enlisted in the United States Army, serving in Europe as a photo interpreter during the war. He became a naturalized citizen of the United States in 1942, the same year that his parents were killed by the Nazis. After the war, he returned to Europe to document the plight of refugee children for UNESCO. 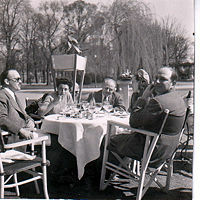 In Paris, Chim met Life Magazine's Paris Bureau Head, Will Lang Jr., and had lunch with him at a café in the Bois de Boulogne. Alongside with him that day was reporter Dida Comacho and photographer Yale Joel. In 1947, Seymour co-founded the Magnum Photos photography cooperative, together with Robert Capa and Henri Cartier-Bresson, George Rodger, and William Vandivert. Although Magnum Photos was based in New York, the photojournalists traveled the world capturing on film the crucial events of the times; Seymour was no exception, spending most of his time in Europe and North Africa. After Capa's death in 1954, Chim became president of Magnum Photos. He held the post until November 10, 1956, when he was killed (together with French photographer Jean Roy) by Egyptian machine gun fire, while covering the armistice of the 1956 Suez War. Chim's career in photojournalism began in Paris, with his work published in Paris-Soir, a large-circulation daily newspaper in Paris, and the weekly news magazine Regards. He covered events of political significance, with his work becoming published in an array of leading magazines, including Life. He was particularly known for his poignant treatment of people, especially children. Seymour was one of the pioneers of the fast moving, front-line, battle photograph. However, he soon relinquished that coverage to his friend and colleague Robert Capa who became famous as a war photographer, preferring to photograph war’s impact on the civilian population. From 1936 to 1938, he covered the Spanish Civil War, and his photographs of its impact on civilians were particularly impressive, receiving widespread attention. After serving in World War II as a photo-interpreter for the United States Army, he immigrated to the U.S., where he joined his friends Robert Capa and Henri Cartier-Bresson in founding Magnum Photos. Chim received an assignment from UNESCO to photograph children in Europe. His sympathetic images of children who had been physically and spiritually damaged by the war proved unforgettable. They were published in 1949, in the acclaimed, Children of Europe. In the following years, he traveled extensively in Europe and Israel, his region for Magnum Photos, continuing to record images of social change and it human impact. Chim's reputation for his compelling photos of war orphans was complemented by his work in photographing Hollywood celebrities such as Sophia Loren, Kirk Douglas, Ingrid Bergman, and Joan Collins. He also produced outstanding photographic essays of Bernard Berenson and Arturo Toscanini. He recorded the emergence of the state of Israel in 1948, and the Suez crisis of 1956. It was there that David Seymour was shot by Egyptian machine gunfire while traveling to photograph a prisoner exchange four days after the armistice. It was probably a sort of escape from the world we are living now to wander through the ancient Greece ruins and sail around the islands…one gets philosophical looking at the remnants of great civilizations. Chim was fluent in several languages and developed deep connections with many cultures. His work served to inform the world, moving people's hearts with compassion for those who might otherwise have remained distant. Seymour, David. Children of Europe. UNESCO, 1949. Seymour, David. The Vatican: Behind the Scenes in the Holy City. Grosset & Dunlap, 1950. Seymour, David. Little Ones. Japan: Heibonsha, 1957. Seymour, David. David Seymour—"Chim". Paragraphic Books, 1966. Seymour, David. Closeenough: Photography by David Seymour (Chim). Art Gallery, University of Maryland, 1999. ISBN 978-0937123386. ↑ David Seymour and Inge Bondi, Chim: The Photographs of David Seymour (Bulfinch Press, 1996, ISBN 978-0821222294). ↑ Corcoran Gallery of Art, The Spanish Civil War, Chim:Reflections from the Heart (2008). Retrieved May 29, 2008. ↑ Corcoran Gallery of Art, Greece, Chim: Reflections from the Heart (2008). Retrieved May 29, 2008. ↑ Susan Stamberg, David Seymour's "Reflections from the Heart," Morning Edition (NPR, March 23, 2006). Retrieved May 29, 2008. ↑ Corcoran Gallery of Art, Reflections from the Heart: Photographs by David Seymour (Chim) (2008). Retrieved May 29, 2008. Beck, Tom. David Seymour (Chim). Phaidon Press, 2006. ISBN 978-0714842769. Capa, Cornell. David Seymour. Penguin, 1974. ISBN 978-0670258321. Miller, Russell. Magnum: Fifty Years at the Front Line of History: The Story of the Legendary Photo Agency. Grove Press, 1999. ISBN 978-0802136534. Seymour, David, and Inge Bondi. Chim: The Photographs of David Seymour. Bulfinch Press, 1996. ISBN 978-0821222294. This page was last modified on 10 November 2017, at 22:38.